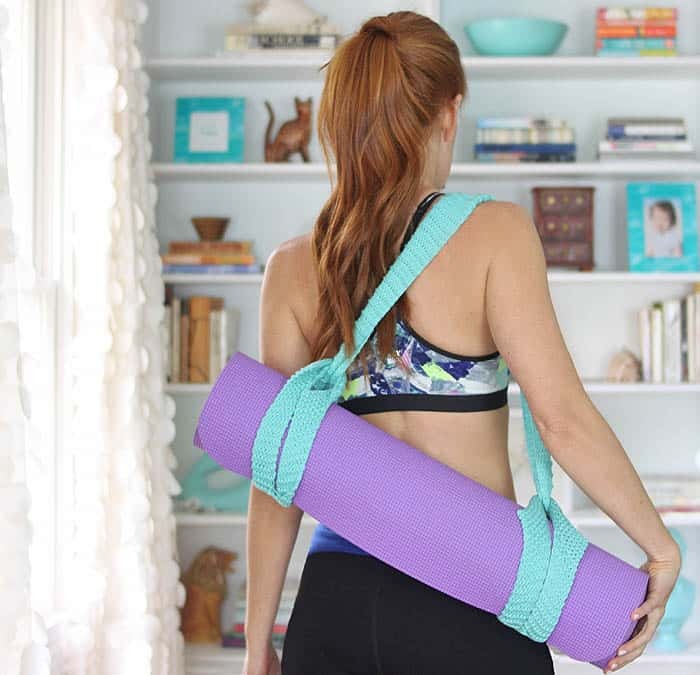 I started taking yoga again recently and I wanted a cute carrier for my mat. I thought about knitting (or sewing) a tube that fits over the mat, but rolling the mat up tightly and stuffing in the bag after every class seemed like a hassle. 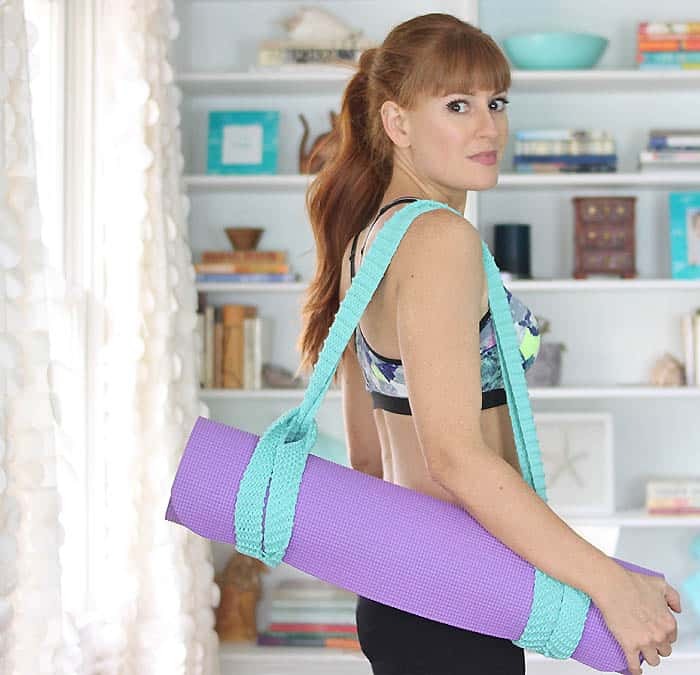 This Yoga Mat Strap solves the problem! It loops into itself and fits over the ends of the mat. It takes seconds to put on! I knitted this yoga mat strap using Bernat Home Dec yarn. This yarn is perfect for Spring knitting patterns because it feels more like fabric than a heavy fiber. The texture is similar to t-shirt yarn. This strap is easy to knit and great for beginners (as long as you know how to decrease and cast on new stitches) Happy knitting! Cast on 24 sts. Knit for 2 inches. Knit 9, bind off 6sts, Knit 9 sts. The 2, 9 stitch groups are worked separately. Knit the 9 sts group until it is 4 inches long. Break yarn and knit the other 9 sts group until it is 4 inches long. Once the ends are even in length, knit across all 18 sts. Keep working in Garter stitch until pieces measures 32 inches from the cast on edge. Knit 9 sts, place other 9 on a holder. Knit the 9 stitches for 4 inches. Take the other 9 sts off the holder and knit until it measures 4 inches long. Knit across the 9 sts, cast on 6 sts, then knit across the other 9 sts joining the 2 sections together. Knit for 2 inches. Bind off.